why the change in personal lives? what are you spreading ? Women are complex beings governed mainly by emotions. Their emotions dictate their desires and decisions. If women are strong and in control of their emotions, they can compartmentalize their feelings and make rational decisions, otherwise their emotions get the better of them. Our Muslim Ummah is suffering many crises; one of them is the neglect and abuse of women on all levels. Muslim men are far away from Allah SWT, and are either ignorant or negligent of their role as educators and true care-takers of women. Most Muslim families can be called dysfunctional and this complicates the already complex emotional state of Muslim women. Absence of stable family environment combined with their ignorance of their Lord and the purpose of their creation makes them shallow and specious. Add to that lack of contentment and pressure of ridiculous expectations of the society, which creates insecurities. These insecurities cause women to make irrational decisions, which usually result in failure at personal level. They try to cover up these insecurities by trying to prove themselves in the professional arena. 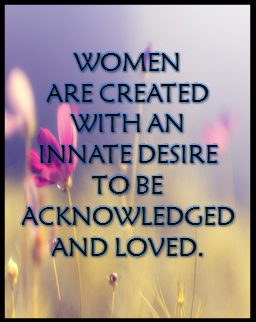 Women are created with an innate desire to be acknowledged and loved. They thrive on compliments and emotional success. It fulfils them. Whether due to being products of dysfunctional families or for any other reason, when they fail to live out this desire in their personal lives, they try to make up for it in their professional lives. They pour themselves out in their field of expertise to gain “success” and “praise.” This is where all their energies go and with time they continue to excel in their professional field while simultaneously becoming bankrupt in their personal lives. The same goes for men! The topic started when a Muslim sister recently asked me this question. So here, even though we will discuss this topic as a women’s issue, it applies to men as well. 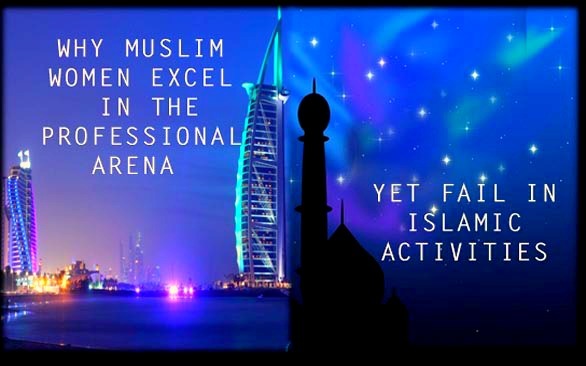 In professional arena, Muslim women display exceptional qualities. From voice, manner, attitude, patience, professionalism, zeal and ability to tackle tough situations or hardships, punctuality, responsibility—you name it, they have it! In a nut shell, they give their professional lives the best of them. Who do they want this pampering from? Their spouse who might be in the same state of exhaustion and need? To be honest, I have seen many women to be greater contributors at home despite their professional demands. Women in general seem to be better at multi tasking and are meticulous in balancing many chores efficiently. They cook, clean and take care of whatever else needs to be done once they arrive home from work. Whereas, most men go straight to the TV, social networking sites, or spend their time watching news or games. We are going to a very fast speed life. Faster than what we can handle. Today we vie for faster computers, faster internet, faster phones, faster cars, faster ambitions; this need to be fast affects every aspect of our lives—even our desires and emotions. An average day in a successful professional’s life consists of waking up in the morning, washing and hurrying to her job, cramming herself with work she can barely handle, and returning approximately twelve hours later, physically, emotionally, and mentally drained. After this fast paced day, what is left in her is very little. She does not have the strength to go on, yet she continues to oppress herself. While living this continuing cycle of exhaustion and always pressed for time, she still wants to sleep, relax, receive compassion, have a love story, have successful physical relationships, plus all the perks of life. Even when worn out, if the manager, business partner or college professor calls with additional work or overtime, she conjures up zeal, ambition, strength, patience and perseverance to continue for another eight to ten hours, sometimes for days. How is she able to do this? Because everything she does is for dunya—the material life. This is the main thing! This meticulous personality of Muslim women is also displayed in Islamic activities and mosque events. They appear neat, calm, happy, and display beautiful manners. However, unfortunately as soon as they go back to their personal lives, a different person emerges. This is when the bickering, blaming, complaining and attitude starts. Often women blame their periods or hormones for this behavior but what amazes me is that the hormones only act up inside the home; but as soon as she steps out of the house the same beautiful manners and calm face returns. 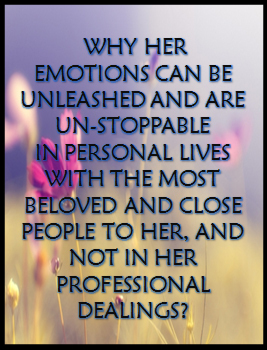 Now the question arises: why her emotions can be unleashed and are un-stoppable in personal lives with the most beloved and close people to her, and not in her professional dealings? Once I met a man with the appearance of a beautiful practicing Muslim who performed all his prayers at the mosque. When I saw him pray, I was jealous of his beautiful salah. But once I came to know him personally, the reality of the character emerged, and it didn’t match either his appearance or his devotion in prayers. He was bankrupt from Islam and the character of a Muslim in his personal life. I also knew a Muslim sister whose voice, compassion and manners could melt anyone’s heart. I believed that this lady possessed beautiful character and always thought of her husband as a very lucky man until I called one day at an unusual time! The woman who answered the phone had a very angry, nasty voice, and rude manners, in fact no manners. When I asked to speak to the sister I had called for, there was absolute silence! After I repeated my question two, three times, she finally responded in her same sweet voice, “speaking!” I asked her about who had answered the phone; again, silence! After I insisted, she told me it was her. I said, “Please forgive me but can I know who I am talking to now—the one outside or the one inside? And which one is the true one? Yet again, silence! How come so-called Muslims can have certain qualities and manners outside that they are bereft of inside their homes? How does it happen? Can we blame the hormones, menstrual cycle, or pressure of work for this hypocritical attitude? Some men go to the extent of abusing their wives and children in the name of life’s pressure. Is this justice? Is this right? Is this Islam? Why is it that when the wife is kind the husband takes advantage and becomes harsh, tough and treats her very badly; and when the husband is nice, he is treated roughly by his wife? How come we are expert communicators on a professional level but have lack of communication with those nearest and dearest to us? Why do we oppress each other? Is it genetic, cultural, diseases of our hearts and/or bad habits? If so, then where is Islam? 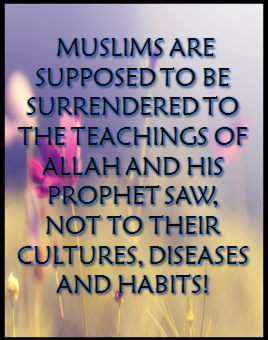 Muslims are supposed to be surrendered to the teachings of Allah and His Prophet SAW, not to their cultures, diseases and habits! They are supposed to have one personality, wherever they may be! Why can’t we have one personality, character and manner? How can we be so loyal and sincere to our boss and company but are not able to have the same level of sincerity towards Allah SWT and the relationships He has bestowed on us? Why do we have the least tolerance for people most close to us? There is an answer but it is ugly, very ugly! Our hypocrisy, arrogance and ego are high but from the fear or respect for the manager, the owner or the professor, we are willing to conquer them and show our best. However we do not even give two percent effort— compared to what we give our material life—for the sake of Allah, for our spouse, and for the journey of our faith to paradise. This is the truth of the matter! We are living for our money, for our material status and are willing to do anything to succeed. Because this is our priority and our definition of success! This is where we spend 95% to 99% of our wealth, thought, compassion, strength, time, and physical ability. We give our journey of faith and personal life the leftover of us—the weak, corrupted, fragmented, broken leftover. 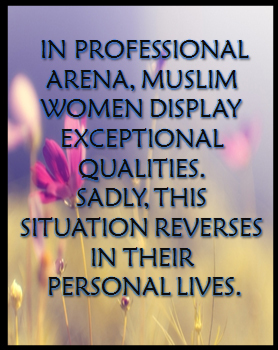 So why do women pour themselves in their professional field and not any other area such as Islamic activity? These two reasons are actually interconnected. Those who have humility receive the guidance from Allah. Once Allah SWT guides people, their priorities automatically change and they focus their energies towards more meaningful things rather than on mundane things that only bring instant gratification. The more a woman is successful in the professional arena, the more arrogant she tends to become. This arrogance continues to further her from the guidance of Allah and pushes her further into the cyclone of a material world which has no end. Another reason is lack of sincerity and the desire to show off. When she excels professionally, she has material wealth, titles, praise and accomplishments to show which satisfy her shallow insecurities. Whereas with Islamic activity the reward is unseen and only with Allah SWT and might never be seen in this life. There is a saying that, “your heart lies where your treasure is." Women excel in the fields they value; they believe their profession to be their treasure so they work their hardest to achieve that. We are pre conditioned to think about and value the treasure, and set priorities in our lives accordingly. If that treasure is not akhirah (after life),then it will be dunya (material life) and this is what is happening to Muslims today. We are running after this material life which is nothing but a mirage and will fade away. 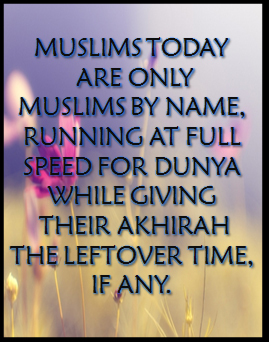 Muslims today are only Muslims by name, running at full speed for dunya while giving their akhirah the leftover time, if any. We invest our entire selves—time, money, effort, energy—in our professional and material success. As a result we develop diseases of the heart which reflect in us through bad manners, lack of compassion and tolerance, being un-accommodating to each other etc. It is selfishness, greed, envy, jealousy and anger that rules us—not Islam! Top this with ego and arrogance gained by prestigious job, savings in the bank account, or the luxury car the person drives—and we have an ego-centric individual who is bound to fail in personal relationships! This combination eventually results in the people losing their basic humanity and compassion towards others. Women lose their own femininity and men lose their manhood. Instead of creating relationships and enhancing each other’s lives, they focus on showing others down; and before they know it, they damage and lose the most precious relationships in their lives. All because first and foremost they lost the relationship between themselves and Allah the Almighty, and lost the battle between themselves and shaytaan. This is a glimpse of the current ugly face of the Muslim Ummah. The remedy is very simple if we follow the teachings of our beloved Prophet SAW which repeatedly encourage us to focus on ourselves, blame ourselves, correct ourselves, and forgive others. Today, we are willing to generate war over small issues in our lives. Anything that happens against our will or desire makes us moody, we start acting up like children pointing fingers, arguing, fighting, bickering and go as far as divorce or breaking the relationship with our Muslim brothers and sisters. All because we are not willing to look beyond ourselves, neither ready to forgive each other’s mistakes nor able to accommodate each other for the sake of Islam or to strengthen the fabric of the ummah. I am very nice to people at a professional level (maybe I try to impress) but at personal level I take things for granted. I am very soft with people outside but try to boss around in my house. I try to hide my habit outside or adjust a lot but can never adjust at home. The recipe of success here is to focus in you! If I start by me and you start by you, if I do my best and you do your best, the situation will automatically be resolved and you will see the results. Now each one of you can think, reflect, contemplate and come back to yourself with an analysis of your situation. This journey of correction will vary from one person to another depending on age, background, ethnicity etc. 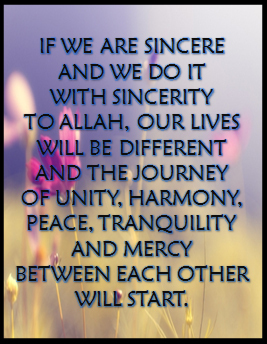 If we are sincere and we do it with sincerity to Allah, our lives will be different and the journey of unity, harmony, peace, tranquility and mercy between each other will start. Once this happens, that will be the beginning of strengthening the nucleus of the Muslim ummah—the families! Traditionally a woman was compared to a bird that takes care of its nest. If the bird takes care of its nest and reinforces it, it will last; if it neglects it, it will fall apart. Do I spread a peaceful harmonious feeling and atmosphere in my house or the opposite? Am I really content with the decree of Allah and accept my life struggles and challenges as Allah’s choice for me? Or do I blame and complain about what He SWT has chosen for me? Many people without realizing live in a cycle of blaming others and complaining about their problems; which in reality is lack of gratitude and thanks to the decree of Allah and thus kufr-disbelief! The reality of the person always comes out. Those who are unhappy and ungrateful spread contention; whereas those who are tranquil and peaceful, spread that feeling around them. Therefore always be vigilant about what you have within and what you are spreading outside! a. Recording your voice every time you talk . b. Writing down what you are thinking about. Do that on a daily basis for a number of weeks or even months. Listen to yourself at night when you are alone and read your thoughts. The internal reality of you will begin to emerge. Now you can attack one weakness and disease at a time until you overcome them all. 2. Get in the habit of constantly remembering Allah (dhikrullah). 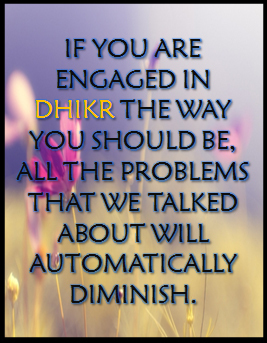 If you are engaged in dhikr the way you should be, all the problems that we talked about will automatically diminish. 3. Do not allow yourself to think any negative thoughts. Negative thoughts are an indication that shaytaan .has taken over internally; now he will keep you busy with bickering, remembering the mistakes of others, and trying to be the big boss who is always right-even if you are not. This will continue until it becomes your habit and this is the attitude you will bring to all relationships in life. This attitude is a recipe for disaster! Many women have a lot of negativity when they talk to their husbands or talk about them to others. If you hear them, it makes you feel like their men are the worst people and have no goodness at all. I want you to know that this is the trick of shaytaan; if shaytaan possesses you and allows you to reach this level, he will fill you with anger, discontentment, ingratitude to Allah, and disbelief and mistrust in your spouse. The bottom line is that he will make you have intolerance for any conversation and whatever comes from you will always be in the form of bickering and negativity, even if it is true. 4. Always remember the goodness of others and do not allow yourself except to think positive thoughts. This will allow you to fight your shaytaan, keep you focused on yourself and allow you to keep going in the journey of correcting yourself and win the battle with-in. It is the quality of a mo`min (believer) to think about the goodness of others. Once you remember that you are dealing with people and all people are full of mistakes, and you focus on goodness instead of shortcomings, you will develop the tolerance to deal with their faults or weakness. Let’s say bismillah and start our individual journey with a good gesture! “Coward is the one who overlooks his own mistakes and bad habits and remembers others’ mistakes and habits; this keeps him weak within and he is unable to face his true self and rectify it. May Allah SWT allow us to be real Muslims who do, not fake ones who only talk. May Allah SWT open our hearts and give us the bravery and courage to rectify our problems. May He SWT allow us to remember other’s goodness and make du’a for them instead of focusing on their shortcomings. May He SWT decorate us with good manners beloved to Him and His Prophet SAW.